Five years and five movies in the making, “Phase One” of the Marvel cinematic universe culminated in 2012’s The Avengers, the first true big-screen superhero team-up in the vein of a comic book crossover. With a cast of stars drawn from every movie in the series thus far (except the ever-troublesome Hulk, who was recast for the third time and debuted with barely a mention of his previous film), Marvel took the gutsy step of handing the production over to geek god Joss Whedon. Whedon was well-known for his TV work from Buffy the Vampire Slayer through Firefly, but The Avengers was only his second film. Still, acting as both director and collaborating screenwriter, Whedon was able to create a film so deft and balanced that The Avengers became the third-highest-grossing film of all time on its release and received better critical notices than any other Marvel film since Iron Man. In constructing a score for The Avengers, director Whedon had plenty of options open to him, as each of the five setup movies had been scored by a different composer: Ramin Djawadi, Craig Armstrong, John Debney, Patrick Doyle, and Alan Silvestri. Whedon’s only previous film, the 2005 Firefly-concluding Serenity, had been scored by industry veteran and perpetual underdog David Newman, who had plenty of superhero experience of his own though his output had been tapering off through the 2010s with an increasing emphasis on the concert hall. In the end, though, it was all about theme: Marvel and Whedon wanted a grand old-fashioned theme to tie their film together, and only one of the previous Marvel composers had provided such a theme and used it in their film consistently: Alan Silvestri. On the strength of his Captain America theme and an enthusiastic recommendation from The First Avenger director Joe Johnston, Silvestri got the gig. In discussions with the producers, Silvestri was instructed to stick with a theme for the Avengers and only a theme for the Avengers. Post-Batman Begins concerns about music being “intrusive” led to the producers’ dismissal of a leitmotivic score in the John Williams vein in favor of a score that had an “old-fashioned” theme in a more contemporary and “less intrusive” framework. Silvestri was allowed to pen a motif for Loki, the main villian, and to make sparing use of the theme that got him the job from Captain America, but mostly in fragments or short bursts to avoid being “intrusive” or competing with the main Avengers theme. 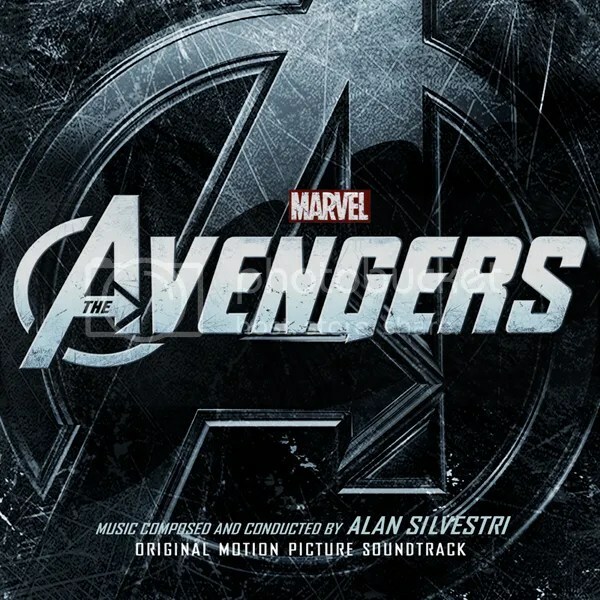 And, to be fair, the Avengers theme that Silvestri wrote fits the bill: it’s brassy and bold in a way that not many superhero themes are post-Batman Begins, and almost completely devoid of synths and other electronic accoutrements (though with a very large and very contemporary percussion section at times). Teased in “Tunnel Chase,” the theme explodes to the forefront in the “old-fashioned” way that Whedon and the producers wanted in “Assemble” before being sent off with a bang in the end credit suite “The Avengers.” The theme is an excellent one, but it is not used as often as it might be: it is frequently teased but only appears in full muscular form in a handful of key moments. The feeling that one gets from this, especially after the much more integrated theme for Captain America in Silvestri’s previous Marvel assignment, is that Silvestri is holding back from full-on action a la The Mummy Returns or Van Helsing–exactly what the producers wanted. Speaking of Captain America, his theme is heard in some of the titular superhero’s most superheroic moments, though never in anything resembling the punchy “Captain America March;” true to the producers’ demands, the theme never competes with the Avengers theme. Though Silvestri was explicitly allowed to write a motif for the villainous Loki, it is a complete non-entity in the film and on album, mirroring the disappointing lack of thematic identity for the character in Patrick Doyle’s Thor (the character would need to wait until Brian Tyler’s Thor: The Dark World for an even somewhat memorable motif). Oddly, the only other bit of overtly thematic scoring goes to the Black Widow character, who gets a Slavic-tinged idea in the CD-exclusive “Interrogation,” the lengthy “Red Ledger,” and (briefly) “I Got a Ride.” While it’s nice that the only female hero on the team was given a theme of sorts–something John Debney had failed to do in her Iron Man 2 debut–once again the feeling one gets is of a composer holding back, scoring with the parking brake on. It goes without saying that, given Marvel’s desire not to have Silvestri use themes for each hero, that none of the previous films’ themes by other composers are used in any way whatsoever. While this makes sense in some cases–especially since Iron Man had already been given two different sets of thematic material–it’s disappointing that Silvestri couldn’t have at least tipped his hat to one of the themes in much the same way that his own Captain America theme was given a brief shoutout in The Dark World. It also means that Silvestri’s fully-orchestral and skillful music for the remainder of the film, despite some highlights, feels oddly anonymous and neutered. It’s leagues better than a lot of the sound design and sonic wallpaper that has become de rigueur post-Batman Begins, but the scoring pales in comparison not only to Silvestri’s aforementioned fantasy action music but superhero scoring from the post-Superman and post-Batman 89 eras. The Avengers was also the start of a relationship between Marvel, Disney, and Intrada Records: on all future Marvel releases, Intrada would provide a deluxe CD product at a premium price for collectors, while a digital album filled the iPods of everyone else. In this case, Intrada’s physical album features substantially more music, and some lengthened cues, compared to the digital download; it therefore stands as the preferred version of the music despite a $10 price difference. Be sure to avoid the “Avengers Assemble” coaster, which doesn’t feature a note of Silvestri alongside a group of pop songs which, if they appeared in the film at all, did so for three seconds on a jukebox blaring behind an alien space battle whale. The Avengers winds up being a difficult score to characterize. On the one hand, it features perhaps the best theme of any Marvel movie to date. On the other, the theme’s sparing use and the relative anonymity of much of the supporting material–out of fear of being “intrusive”–makes the score feel like a missed opportunity. One wonders what Silvestri might have produced if he’d been fully unleashed on the project, or if the film had been during a different paradigm of superhero scoring. As is, it’s recommended for that glorious theme but a bit underwhelming elsewhere. Silvestri, despite scoring such a successful film, did not seem to get much of a career boost from The Avengers; he would be passed over for Captain America: The Winter Soldier and Avengers: Age of Ultron, with only a few mediocre scores for regular collaborators to fill out the remainder of the decade. As with James Horner and Avatar, the success of Silvestri’s thematic approach made little headway against the current Hollywood scoring trends.